Log Haven is a waterfront haven on Smith Mountain Lake in Huddleston/Moneta area. Our true log home is conveniently located to all that Smith Mountain Lake has to offer. Wide water views of Smith Mountain with stunning sunrises worth waking up for which can be enjoyed right from the comfy Master Bed. Our deep water dock has clear, clean water and is perfect for swimming, fishing and all your water toys. Very convenient to grocery stores, marinas, restaurants, shopping, Smith Mountain State Park, golf, and wineries. Our home has all the amenities. Large lakefront hot tub; 2 large, stone, wood burning fireplaces; dock with sundeck and floating dock; shallow water area with sandy bottom; lakefront porch with comfy swings and rocking chairs; pool table; cable tv; and free high speed wifi. Our home sleeps a maximum of 4. Our Master Bedroom has a King bed and is located on the first floor in addition to the Great Room (with large, stone Fireplace), Kitchen and a full Bathroom. Our 2nd floor Bedroom can be configured as either a King OR 2 XL twins and has its own bathroom with shower. The finished, walkout Basement has waterfront views to be enjoyed while you play pool and watch tv in addition to a 2nd large, stone Fireplace, Laundry room, and ½ Bath. A beautiful view of Smith Mountain is always a treat and the sight from Log Haven over the water and treeline is superb! 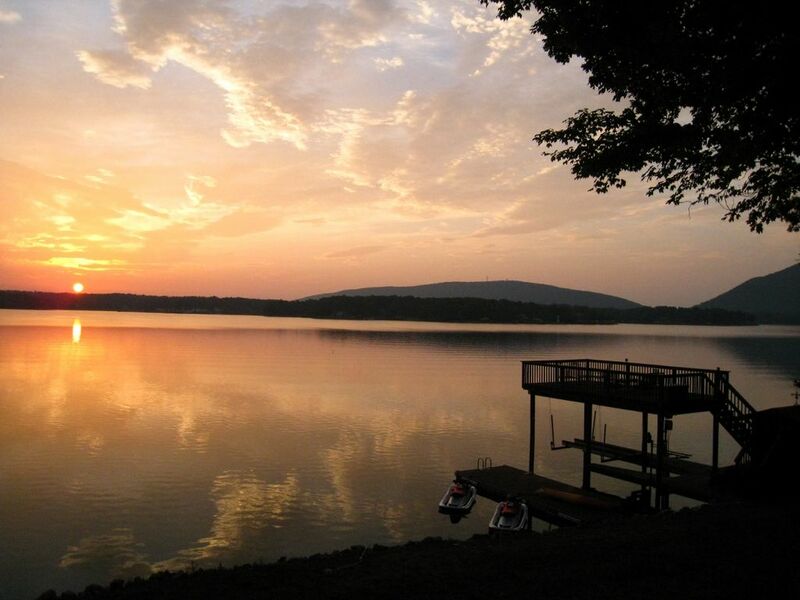 Smith Mountain Lake offers so much to residents and guests! Having private access to it is a definite plus for us! This is one of our favorite parts of visiting Log Haven! The views of the lake are stunning - morning, noon and night. Walking off the back deck or from the patio 30 feet to the lake is such a treat. Whether going to relax on the sundeck, hop on a rented pontoon or take out the kayak, we love being so close! We love hopping out of the hot tub and walking just 30 feet to Log Haven's private dock and two-story sundeck. What a treat! 2-large stone wood-burning fireplaces, Living Room and Basement Gameroom. Wood provided in season. Large picture window overlooking the lake and Smith Mountain. Large wood-burning stone fireplace. Basic Mr. Coffee drip-type. Filters provided. Just bring your favorite ground coffee! Spices, and salt & pepper. From basic to a little more formal, everything you need for your daily meals and entertainment. Good counter space and 6-foot open shelving unit waiting for all your food. Rustic wooden table looks out over the wrap-around porch to an expansive view of the lake and Smith Mountain. Lovely at any time of day or year. On the lower level with a wall of floor-to-ceiling windows looking out over the lake and leading to the sunroom, lower deck and hot tub. Second fireplace is located here. Brunswick 9' table with perfect lighting and ambiance for a friendly game. Stone fireplace and the gorgeous lake view, too! Some childrens' DVDs available. Redbox conveniently located at Food Lion Grocery in Moneta, about 15 minutes away. Mayberry Drive-In Theater, 15 minutes away. Lawn-level deck with hot tub, table and gas grill. Enough lawn to play most lawn games and throw a toy for your favorite four-legged friend. 1- Sit-on-top kayak available for use. 1- Stand Up Paddleboard for use. 1-adult and 1-small child life vest available for use. The wrap-around waterfront porch runs from the first floor living area entrance to the master bedroom. 2 swings, rocking chairs and a table make this an engaging place to eat, visit, read or relax. The Sundeck above the boat lift is the perfect place to dry off and catch some rays after swimming in the lake. Take in the gorgeous view with our seating group and 2 chaise lounges. 1-adult and 1-small child life vest available for use. Lakefront. Enjoy the fabulous view of the lake while soaking in this large, comfortable hot tub. A great ending or beginning to your day. Views were exactly as expected. The hot tub was just what the doctor ordered. Quaint rustic cabin. Be sure to bring items not provided on the list as they will certainly not be there. Extra pillows and throws if you are cold natured as I am. All in all it was great weekend getaway would definitely stay here again. Perfect Hideaway to relax and unwind! My husband & I spent the week between Christmas and New Year's Day in Log Haven.....it was absolutely delightful! The picture windows in the family room and master bedroom have breathtaking views of SML, be sure to get up and watch the sun rise! The cabin is adorable, cozy and well appointed with everything we needed for the week. We had a couple of rainy days and spent one in the basement area playing pool and reading....such a perfect place to spend a rainy day. The hot tub overlooks the lake and is actually quite private from view of the neighbors and a fabulous place to watch the sun rise or set. We had roaring fires in the upstairs fireplace every night.....I'm going to miss that sight, as it is so serene and relaxing. We were also blessed with some unexpected warm, sunny days and took cheese, crackers & wine (that we bought at nearby winery Ramulose....be sure to go, as the wine maker personally does the tastings and is wonderful to talk with. Their wine is tasty!) to the upper deck of the dock and just watched wildlife. Something important to share is that the master mattress was very comfortable! (we didn't use the upstairs room, so I cannot speak to them) We would absolutely recommend time spent in Log Haven, it'll do your soul good! The lake is beautiful, it is quiet and there are deer everywhere as well as other wildlife. Love to come back in the summer and see everything from the lake! I spoke to the owner Mark a few times along the way. Mark was great. Answer all our questions. The property was fantastic. Mark and Chris, the owners, are great to work with. House was clean but the fireplace wasn’t working. Smoke filled the house. Thanks for calling us during your weekend visit to let us know about the problem you were having with the main floor fireplace. We're sorry the chimney sweep could not be scheduled during your stay, but it was serviced shortly after. The sticking damper was fixed and is fully operational again. We enjoyed talking with you and hearing how you were enjoying your visit. Even though small inside, it had everything available to enjoy the outside. It was clean and comfortable. Pillows were lacking, but still usable. The area on the outside and down to the lake were terrific. Hot tub was nice, but really too hot to enjoy with the hot weather! A cool lake plunge was better. Owner is VERY responsive and concerned with any issues. Hope to get back to the lake soon! Summer weeks start and end on Sunday Check in time is 4:00pm Check out by 11:00 am.